Day 40 of the 2016 World Series of Poker saw the second of three starting flights for the 2016 WSOP Main Event go off at the Rio All Suites Hotel & Casino. The biggest buy-in event of the year finished up, as a champion was crowned in the $111,111 High Roller for One Drop, and a poker dealer from Detroit won the 2016 WSOP Ladies Championship. 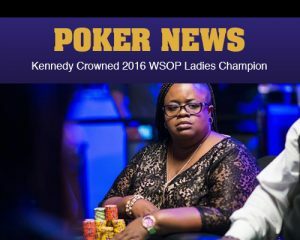 Courtney Kennedy a 37-year-old Detroit, Michigan poker dealer won the 2016 World Series of Poker Ladies Championship on Sunday. The final table included WSOP Circuit ring winners Amanda Musumeci, Wendy Freedman andAmanda Baker, alongside 2016 WSOP Colossus II ninth-place finisher Michelle Deng and Team PokerStars Pro Yaxi Zhu. Kennedy beat Baker heads-up after taking what would prove to be an insurmountable lead with five players remaining in Sunday’s final table. Three handed, Kennedy had a 3:1 chip lead over Deng and Baker combined, and never fell out of chip lead position on the way to the win. More from Kennedy on her big win can be found right here. The 2016 WSOP Main Event continues Monday with the third of three starting flights beginning at 11 a.m. It is widely expected to be the largest of the three flights. Plus, the 2016 WSOP Event #66: $1000 WSOP.com ONLINE No-Limit Hold’em final six will play down to a champion live at the Rio beginning at 11 a.m.